@kenbarbi, so sorry for the delayed response but I want to respond to your ideas. First, it is certainly possible that the way I wrote the instructions for suggesting content and adding content are not straightforward. Currently only admins can edit that page because I didn’t want someone to write incorrect instructions. However, if you and the rest of this community think it would be valuable to have them editable, I’m open to it. 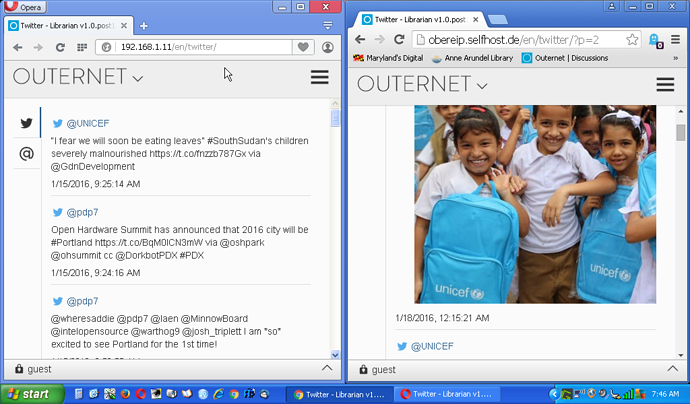 I have added a page (outernet.is/learn) and a section on the wiki homepage called “Outernet Learning Projects” that are designed to be smaller, digestible ways to participate in Outernet. So rather than “how to add anything to Outernet” a project could be “make a photo collage and share it on Outernet.” I would LOVE to see you and others who have a more sophisticated understanding of Outernet create ways for others to contribute. Projects should not just be created by me. With regard to making content requests, I have created mechanisms for Twitter and email requests. If you tweet @ThaneRichard or @OuternetForAll and include #request, the request gets logged. Similarly, if you email [email protected], [email protected], or [email protected] and include #request anywhere in the message (subject or body), it will get logged. All requests are displayed publicly here: https://docs.google.com/spreadsheets/d/1EusqDD3HBG_2uojNH2NOSj1QzX5JjTen9Ei7yPpOU0o/edit#gid=0. The suggestion columns are publicly editable, so anyone can see the requests and suggest a piece of content as a response. We are testing this this week with the UMass Amherst library acting as the curator and requests coming from libraries and schools in Malawi. We will discuss the results on this week’s community call (https://wiki.outernet.is/wiki/Community_Calls). For other suggestion methods, they will have to wait. I think we have enough experimenting to do with these two pathways and the entire feedback loop as a system before we invest more time in expanding the input pathways. For our current users in Africa, requesting via email and/or Twitter are very workable. And this may have to be modified so that only emails coming into [email protected] since it appears that Google is not very smart at searching the exact format of “#request” - every message containing “request” or “#” appear, so hashtagging is not supported. Expect more update on this process later this week. I’ve only read this second part so far Thane, but you can use + signs in emails to make gmail ignore everything after the +. I just read more on the topic and it is a Gmail issue - Gmail search does not recognize # and other special characters. https://productforums.google.com/forum/#!topic/gmail/r2W7vvxIOZ4;context-place=topicsearchin/gmail/searching$20by$20hashtag. For now, only requests coming to [email protected] will be recognized. If this is “Humanity’s Public Library”, what do people generally use public libraries for? What is the pattern of how people tend to use the internet, with the content currently on Outernet as an example? If I moved off the grid, what would it take for Outernet to be my primary data source? On question number one, let’s ponder why people go to libraries and what they do while there. 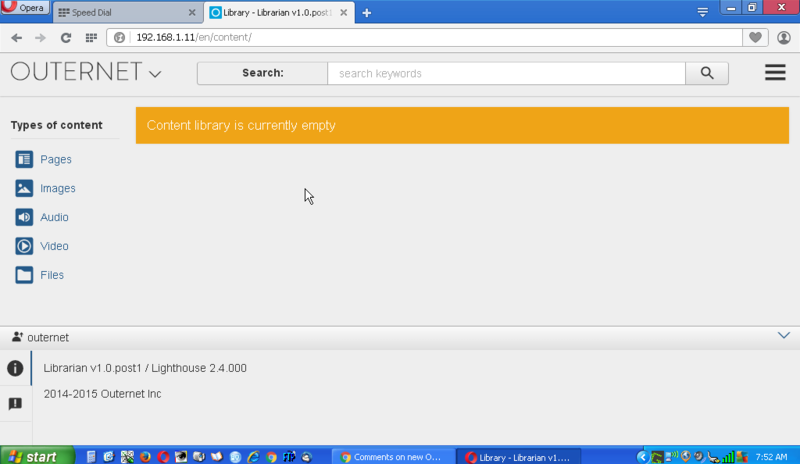 In my local public library, I’ve noticed that the places that get the traffic are: The computer room (i.e. software), the auto repair manuals (because that information is still hard to get online), the novels and other entertainment such as DVDs, and the research sections. I’d say 50% of people go to the library to be entertained, the other 50% go for either research or because they don’t have a home internet connection or computer. Some young adults only have a mobile data connection, while other people can’t afford the $60 a month or so it takes to get decent internet in non-urban areas. Entertainment is a valid reason to visit a library, because people seek to be happy by passing time in interesting ways, and also because things that are entertaining can also be educational. Also, sometimes people choose the library because it’s free or just because it’s quiet. So as a crazy idea, what if when some music comes down from Outernet, the Wikipedia page for the artist and the venue come down with it, and they are linked by ht (hypertext)? And if it’s a collection of songs from a particular label or festival, what if some information about the label or festival comes down as well? Another idea: What if the text for a book came down from Gutenburg, and the audio for the same book came down from Librivox? That would allow people to read the book at the same time they are listening to it, or switch back and forth between the two mediums. It might even help people learn English. I realize this would be a lot more work than just bundling requests. But it would also, in my opinion, make Outernet really rad, and make it fit a model closer to how people use the internet. 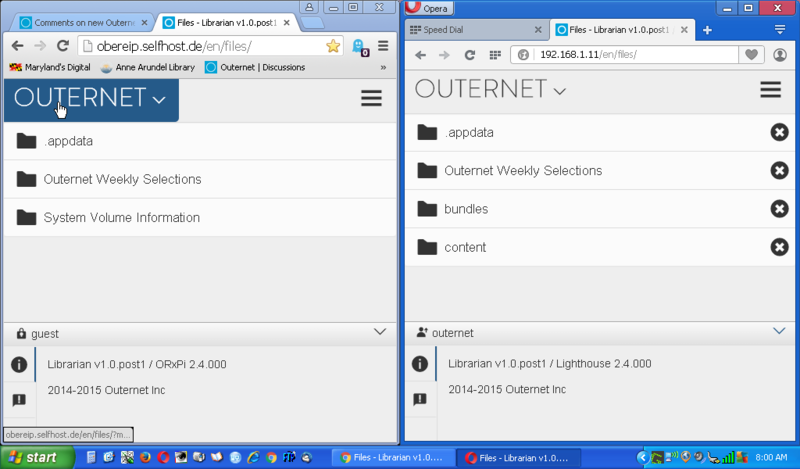 What about having the Outernet website as part of the core content of Outernet? It would allow people to answer the question: What the heck is this Outernet wifi hotspot I just connected to? Also, a PDF user manual for the system would be useful. That’s a chicken and egg of course, but it would allow diagnosing issues with upgrades and things like that, for people without internet connections. It would also allow using the information from a neighbor’s Outernet to set up your own Outernet. Incredibly valid point. If we enable a way to hyperlink content within a library, then users with an internet connection (or even something like WhatsApp) can submit content relevant to the main piece of content. Although Outernet is primarily a one-way service, we do want to engage online users to contribute to the broadcast, This seems like one such way.